How does Baja California scuba diving sound to you? Diving on the tip of the nutrient rich waters of the Baja Peninsula. The marine life in Cabo San Lucas is colorful and energetic. Under water landscapes create a backdrop of beauty for your scuba diving while your on your Baja vacation. The Sea Of Cortez is a sea filled with nutrients around the Cabo San Lucas area. These nutrients in the water bring in more marine life than usual in one place. These waters are also what makes Cabo San Lucas the Marlin capital of the world. If you do your Baja California scuba diving with MANTA you'll be diving with experts. Their staff are PADI certified instructors, and they know the waters extremely well around Cabo San Lucas. 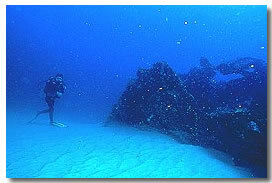 Your scuba diving in Baja California will be safe as well as fun. The staff at MANTA make you their priority. You get a choice of where to dive: Cabo San Lucas, the Los Cabos Corridor and Cabo Pulmo. Which ever place you choose to do your scuba diving on the tip of the Baja Peninsula will be a spectacle of brightly colored marine life. May to November are the best months to dive in Cabo San Lucas. This is when the water is warmer on the Baja tip, and you get to see a lot more marine life. You'll get your money's worth by diving in these months. Your Baja scuba diving comes in packages. These last from 2 to 6 days with the 2 day diving packages staying mainly around the rocks of Cabo san Lucas. You'll move out into the Los Cabos corridor when you go on the 3 and 4 day packages. These and the 2 day packages are all year round so they include the cooler months through the winter. When it's spring in Cabo San Lucas the diving expeditions start. This is when you can go out to Cabo Pulmo where you will visit the only living coral reef on the Pacific Ocean side of North America. Cabo San Lucas gives you the opportunity to see some beautiful marine life during your Baja California Scuba diving.